Last night Zoey came over for a slumber party. Jeremy, Loki, Zen, Ming, Katara, Sensei, 4 finches, and I sure all enjoyed her presence (Zoey however informed me that she currently has 10 pets at home, so has us beat by 1). From playing with the dogs in the backyard, to sorting out the toy box, showing her latest dance moves, and then scrapbooking like there was no tomorrow. We were particularly touched when she scrapbooked a page for us for our upcoming anniversary. She was an amazing flower girl almost two years ago. It was a precious day for us, and something we both loved sharing with her. 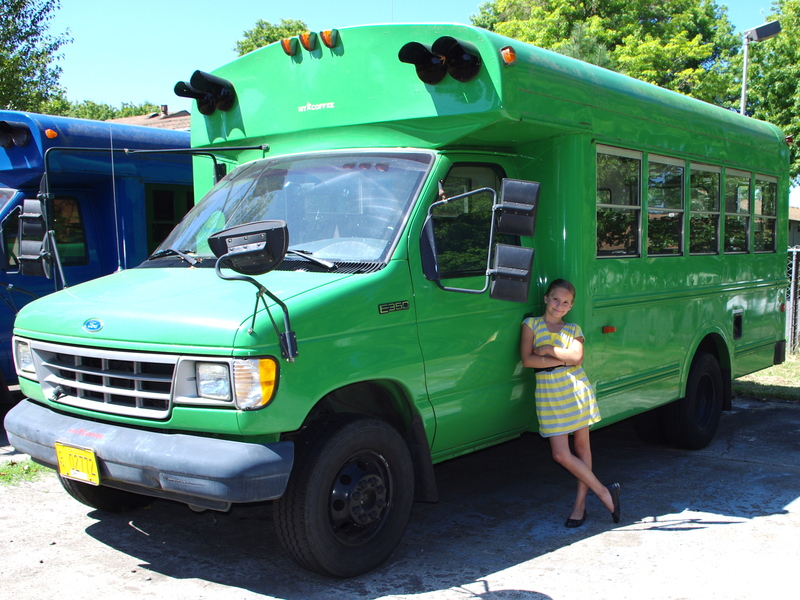 One of our favorite pictures from the wedding is by this green bus at Eugene Mennonite Church/Wellspring Friends School. 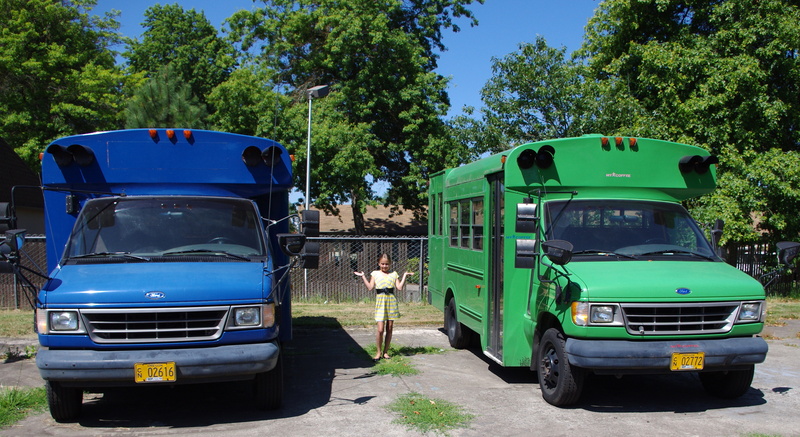 Today Zoey and I took advantage of the green AND blue buses. The sun kept getting in her eyes, but she was a trooper! This entry was posted on Sunday, July 31st, 2011 at 1:32 pm	and tagged with Eugene Mennonite Church, school bus, scrapbooking, wedding, Wellspring Friends School and posted in activities, best friends, crafts, dog, photoblog, sun, youth. You can follow any responses to this entry through the RSS 2.0 feed.